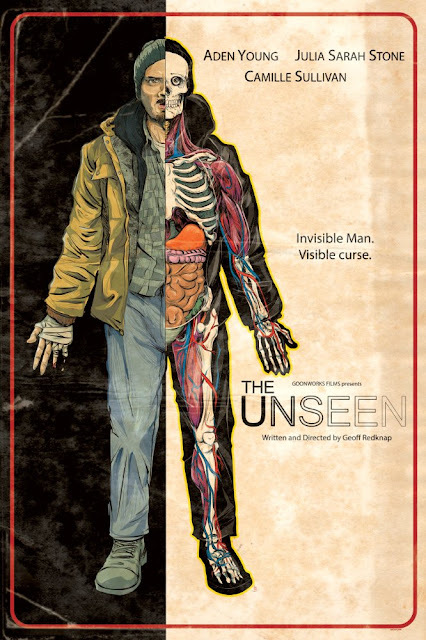 We all feel invisible at certain times, we can all identify with feelings of alienation - The Unseen, written and directed by Geoff Redknap, is about a man who is losing himself - mentally, emotionally, and existentially. 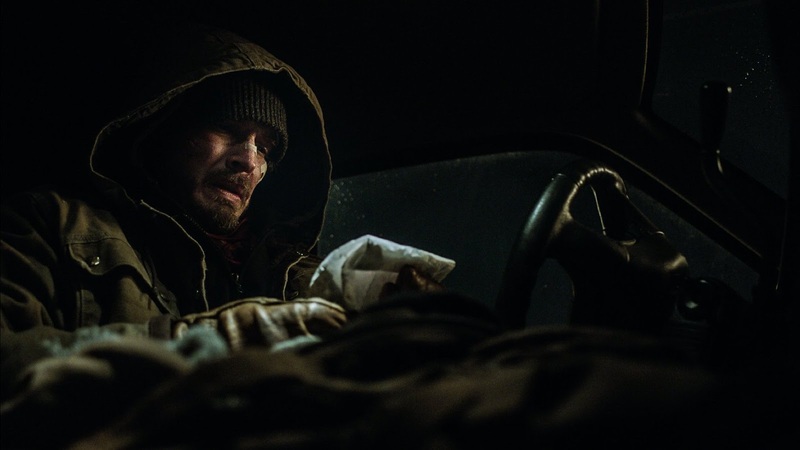 Bob Langmore (Aden Young) is living in lonely, self-imposed isolation in a remote part of Canada. His job at a paper mill is insecure, his ex-wife in the city wants him to reconnect with his teenage daughter who is becoming increasingly disaffected and whom he hasn’t seen in eight years. These are not the worst of Bob’s problems - he suffers from bouts of searing pain and intensely suicidal thoughts. He is seriously ill. When he gives in and quits his job, finally convinced by ex-wife Darlene (Camille Sullivan) that he needs to help with his daughter Eva (Julia Sarah Stone), he is cunningly blackmailed into working as a drug mule for an oily crook named Crisby. The truth is that Bob is concealing a terrible secret - he is losing himself physically too. Slowly, painfully, bit by bit, his body is disappearing, leaving bloody, gaping holes in his torso and limbs. His daughter Eva also has a problem. Unfortunately, the only person who can understand is the father who abandoned her. When Eva goes missing after an ill-judged outing with her friends, Bob sacrifices everything to find and save his daughter. In The Unseen writer/director Geoff Redknap attempts to combine body horror, science fiction, family drama and crime thriller in his storyline and manages to sustain all fairly successfully. Redknap is also a veteran make-up effects artist, having worked on genre favourites like The Fog, The Cabin In The Woods, The X-Files and recently Deadpool, so it should be no surprise that the effects involved in Bob’s gradual physical deterioration are very impressive. Bob is initially seen as constantly patching himself up, doing his best not to make his condition visible. When the bandages finally come off, it’s quite a shock. What gives the story its anchor however, is the relationship between Bob and his daughter Eva. We have strong performances from both Young and Stone as the father and daughter who are each struggling with their own secrets. The sub-plot involving Eva’s disappearance is tense, but what keeps us watching is the ticking clock element of Bob’s illness. Will he have enough time to find Eva and rescue her before his time runs out? What happens when it does? Cinematographer Stephen Mier makes the most of the bleak and wintry Canadian landscape, which mirrors Bob’s barren existence and his melancholy state of mind. He also employs effective techniques in shots to highlight Bob’s unusual and disturbing physical condition. The Unseen does meander a little during a scene in a mental asylum that attempts to introduce a backstory for Bob’s illness, and which creates a mythology about his invisibility. This tends to only complicate matters (sometimes metaphor is enough - ask H.G. Wells). Nevertheless, the film can generally boast considered and effective writing. The Unseen proves to be a strong debut feature from writer-director Geoff Redknap. He gains powerful performances from his cast and utilizes a horror/sci-fi story to examine notions of inherited guilt, redemption, love, acceptance, and forgiveness, exemplified in a broken and troubled family. Just as an added moment of satisfaction, one can also enjoy the moment in the finale when the Canadian Black bear finally wreaks an ironic revenge on an old enemy – what goes around, comes around, it seems.